Here are some romantic restaurants serving up hot Valentine's Day specials sure to make the night extra special. Follow your heart to Library Café; to enjoy their "Sweetheart Specials" this Valentine's Day. You and your special someone can indulge in mouthwatering American classics at this stylish pub set in a former library for the perfect romantic dinner. Check out their Valentine's Day specials and call for reservations at (516) 752-7678. Picture it: you and your honey riding down the river in a Gondola built for two, the picturesque streets of Italy lighting up before you. Well, you can skip the plane ride; Jonathan's Ristorante is offering a taste of Italy's romance right here in Huntington with their special Valentine's Day menu, available on Wednesday, February 14 from 5 p.m on. Treat yourself and that lucky someone and book your Valentine's Day reservations today. If you're in the mood for a little Greek this Valentine's Day, we've got you covered. Get a taste of Greece without leaving Long Island at MP Taverna in Roslyn. This chic eatery is offering specials on Wednesday, February 14th along with their regular menus for a "No Muss, No Fuss"; Valentine's Day. Check here for more information and make your reservations here. From 4 p.m on, stylish seafood restaurant Sandbar is serving a slew of scrumptious a la carte specials for Valentine's Day (including some truly divine desserts). Whether you're single or taken, these delicacies are sure to get the sparks flying. Check them out here and book your romantic dinner for two (or one) here. What's better than gazing out at the Great South Bay while enjoying a candlelit dinner? Nothing, which is why this romantic riverfront restaurant is offering not one, but two Valentine's Day specials this year. In addition to a special a la carte menu available after 4 p.m on February 14, you can also enjoy their Dinner for Two menu, available on Saturday, February 10, Sunday, February 11 and Wednesday, February 14. The Dinner for Two menu costs $125 per couple, plus tax and gratuity, and features four courses of mouthwatering seafood and more for you and your date. Book a table here for a romantic night out. With three and four course prix fixe menus featuring unbeatable Mediterranean cuisine, the woodburning grill won't be the only thing getting hot at Lulu Kitchen and Bar this Valentine's Day. The three and four course prix fixe menus cost $65 and $85 per person, respectively. Recommendations are recommended, so make yours today. Iconic East Hampton restaurant Nick & Toni's is spreading the love this Valentine's Day with their a la carte specials, available with the regular menu on February 14. Treat you and your loved one to some of the best eats on the East End and make your reservations today by calling (631) 324-3550. 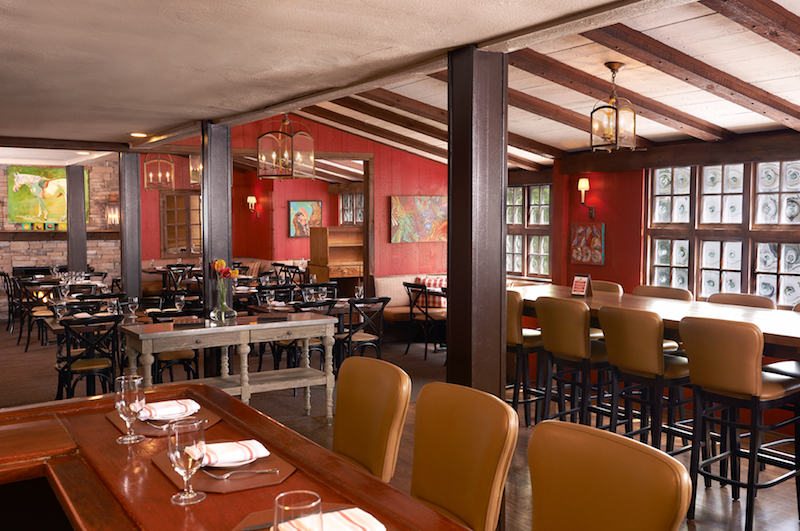 Rowdy Hall - East Hampton Let a chef be your cupid at Rowdy Hall this Valentine's Day. Enjoy French-inspired pub grub in an intimate with their a la carte specials on Valentine's Day, in addition to their regular menu. Share a romantic dinner with that special someone or just treat yourself to their famous burgers; there's no judgment here. Check out the specials here, and make your reservations now by calling (631) 324-8555. Looking for something sweet to share? With an emphasis on fresh, local, and sustainable ingredients, French bistro Almond is serving a special pomegranate themed four-course menu on Sunday, February 10 and Wednesday, February 14. This special menu costs $75 per person, and each dish, from the amuse to dessert, incorporates pomegranate. Treat the apple - well, pomegranate - of your eye to something special this Valentine's Day and book your reservation today. A meal at the 1770 House alone is enough to make our heart flutter, but the historic restaurant is raising the stakes with their Valentine's Day menu, available here. With expertly-prepared contemporary American cuisine, enjoy a romantic meal for two at this historic restaurant and make your reservations here.